This equipment (photo 7) is made up of 2 boiler elements: a storage tank called ‘boiler feed tank’ and a deaerating tower above the tank. The volume of the tank represents about 20 mins of autonomy in feed water from the boiler. Reminder: feed water is made from top up water and returned condensate. 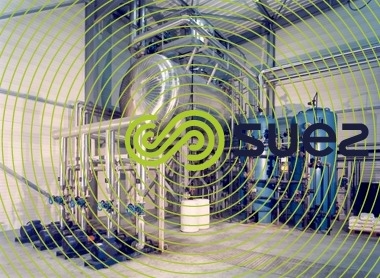 Using steam allows 2 of the necessary functions for the good removal of dissolved oxygen in water to be fulfilled: an increase in temperature as well as the pressurisation of steam vapour (or atmosphere) which is low in oxygen. Steam is introduced into the bottom of the de-aertion tower whilst water is sprayed in the upper part of the tower. Water is sprayed downwards, through the packing made up of stainless steel rings. The packing again participates in the splitting of water into fine droplets, thereby increasing the exchange surface area. The flushing of steam in the opposite direction of the droplets allows optimal deaerating conditions to be obtained as described above: heating up of water and the depletion of atmospheric oxygen (Henry and Winkler laws). In these packed tower systems, residual oxygen content is lower than 10 ppb. It should be noted that the majority of steam used will condense and will used in the boiler’s feed water. As these condensates, produced by steam, are considered as being pure, they are deducted from the required top up water flow. For the record : heating 1 m3 of water from 15°C to 105°C (case of deaerators working at 0.3 barg) requires a supply of 90,000 Kcal, i.e. 11 kg of saturated steam at 10 bars absolute, and therefore, 160 litres of pure water once condensed. 1000 kg of water to raise the temperature from 15 to 105°C, i.e. + 90°C = 90,000 Kcal. Steam requirement = 90 000 / 558 = 161 kg of steam at 10 bar absolute. The deaerating tower has a calibrated opening in its upper part (adjustment tap or diaphragm) which allows a small part of the flushing steam to be removed (which will not have been condensed) and to maintain the deaerator under pressure. This flow of steam is known as “the non condensables”. This diagram shows a deaerator functioning at 300 to 400 mbarg of relative pressure. Internal or external equilibrium piping allows identical pressure to be guaranteed between the tank and the tower. It is fitted with a hydraulic seal which may be used a hydraulic overflow and guaranteeing that the system works at a pressure lower than 0.5 bars absolute. Above this pressure regulations, in particular those from the EC, impose disadvantageous construction methods and controls. Of course, operation above 0.5 bars abs. is possible and this operating method is used for high-pressure boilers generating return condensates under high pressure and high temperatures. 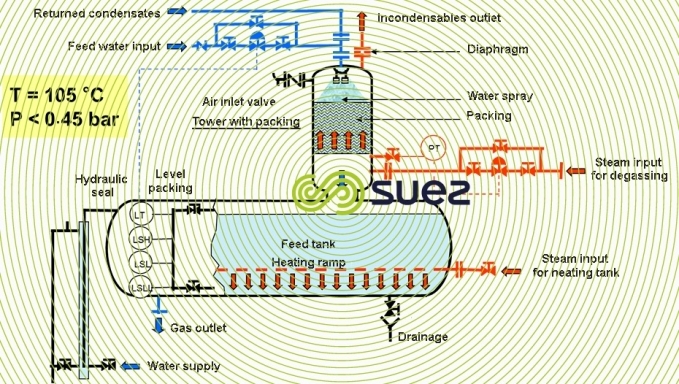 The heating ramp is only useful if steam production is frequently halted or if the tank is undersized in relation to requirements in feed water. All dearators are installed pressurised, onto boiler feed pumps via a metallic structure or a raised platform. Indeed, given the temperature of the water to be pumped, the pumps require suction pressure.